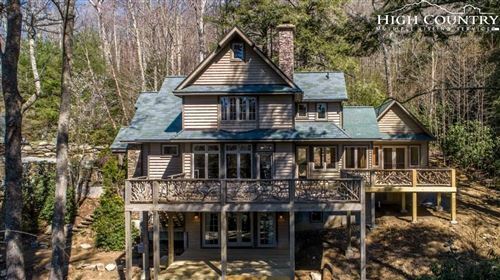 The Lodges at Eagles Nest homesite L-17 is a stunning 3.59 acre, gently sloping property topping out at over 4,800 feet of elevation with panoramic southern exposure, offering spectacular Grandfather Mountain sunrises. The property also features incredibly unique boulder formations and tremendous privacy, with no neighbor on the view side and located on a private drive servicing only three properties. An easy to build on homesite, L-17 is the perfect setting for a very unique rugged lodge or mountain estate. A 3,000+ acre development, The Lodges at Eagles Nest features a wildlife preserve, waterfalls, trout-filled streams and miles of pristine mountain trails. Amenities range from a toy barn filled with every imaginable game and sporting equipment, a multi-purpose ball field, an authentic teepee village, outdoor barbecue pavilion, an amphitheater built into the side of the mountain. The Lodges at Eagles Nest is the premier mountain community in the NC High Country and the properties in the Lodge section are the most exclusive and desirable in the community. Call today about this premier building site!